I’m a big fan of Avatar: The Last Airbender and The Legend of Korra, so when I heard that there was a new series, The Dragon Prince, streaming on Netflix from some of the same creators, I was psyched. Currently, only one season (Book One: Moon) is streaming, but more seasons are hopefully in the works. There’s a lot of hype about The Dragon Prince, and I think it’s pretty well deserved: it’s a fresh, fun high fantasy series with well-rounded characters, including lots of women and POC, which is exactly what I would expect from the people who made Avatar and Korra. I’m especially fond of Claudia, a young mage with a terrible (and therefore wonderful) sense of humor and purple gradient hair that is #goals, and General Amaya, who I’ll get to in a minute. What really stood out to me, though, is the story’s engagement with disability, because it is ON POINT. But beware: here be spoilers! To explain exactly why it’s so good, I’m going to backtrack to Avatar and the character of Toph. Full disclosure: I love Toph, the blind master earthbender who mentors Aang and plays a crucial role in defeating the series’ Big Bad, Fire Lord Ozai. In a lot of ways, she’s a great character (funny, curmudgeonly, and extremely capable). But she also falls into the extremely common trope of the supercrip (someone who is disabled but has some kind of superlative or magical ability or genius that “compensates” for that disability.) For Toph, earthbending functions as magical sight; she can see just as well (and frequently better) than her companions when her bare feet are touching the ground. 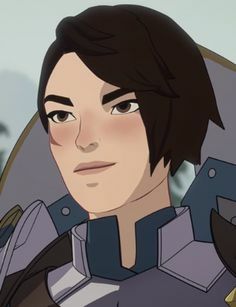 Again, I still love this character and her general portrayal, and I do think there are moments in the series that complicate her supercrip status, but in The Dragon Prince, the creators sidestep the supercrip trope, and other common disability tropes, in ways that are incredibly fresh and awesome for a mainstream fantasy series. Which brings me back to General Amaya. As one of the king’s most trusted allies, she is among the most powerful players in the series – she is on the front lines of the war with Xadia, the magical kingdom in conflict with the human kingdoms. As the aunt of the princes Callum and Ezran (two of the main characters), she is emotionally connected to the rest of the cast. And she is a Deaf woman of color who communicates via American Sign Language. Commander Gren often acts as her translator, but there are a few really beautiful sequences of signing that remain untranslated because the creators decided that “when Gren wasn’t speaking for her, she spoke for herself… [they] wanted it so that understanding what she’s communicating here is for the deaf audience.” Amaya’s Deafness is an integral part of who is she, but it does not define or overwhelm her plot in the story. It is simply part of her character, and there is no bid to magically erase it or justify it. There is an excellent interview with the show’s writers about how they created Amaya, and how they made decisions about representing her onscreen, including ongoing conversations with Deaf and HoH communities and ASL interpreters. The other major instance of disability in Book One involves Ava, a wolf companion to a young girl named Ellis. Ellis found Ava as a pup whose leg was stuck in a human trap. She rescued Ava, but the leg had to be amputated. When other humans insisted that Ava should be put down due to the loss of her leg, Ellis ran away with her, eventually finding a “miracle healer” who restored Ava’s leg. This is all pretty standard “cure” trope, but a twist at the end of the season reveals that the healer did not in fact restore Ava’s leg; instead, she created an illusion of a leg so that people would accept her, even though she was already perfect as she was. At the end of the season, the illusion is unmasked, and Ava is once more legible as a happy, powerful, three-legged wolf. No fixing or curing required! I’m so excited to see what happens in the next season! Hopefully, it will involve a lot more Amaya and even more cool representations of disability!